3000sf Golf Course Home - Huge Pool Great Location! Located in the beautiful Gainey Ranch, McCormick Ranch Area, this home has 4 bedrooms, 2.5 baths and is located right on the the beautiful golf course. The home features a huge covered patio, and large pool. It has spectacular golf course views. You can walk the course in the evenings. The home is right down the street from the world famous Hyatt Gainey Ranch. The home itself has granite counter tops, travertine floors, and is well appointed. Home has 3000 square feet. We promise you can't beat this location!!!!!!!!!!!!! There is a private lake walk, bike paths, walking paths, restaurants and shopping nearby. If you want pool heated that is optional and additional charges apply to have pool heated. Great location. Near everything in Scottsdale. Kitchen updated. Pool & deck inviting. Owner responsive. Good/great walking trails/restaurants nearby. Hiking trail-heads a short drive away. Played the golf course on which the home is situated, and reckoned that the home is on #16 of the Palms course at McCormick Ranch. McCormick is not a premier golf course, in my personal opinion, but it`s a good place to knock some rust off your golf game without spending a lot of money or driving time to get to a golf course. And tons of other golf options are near-by. Easy drive to old Scottsdale to shop & dine. Easy drive north for other shopping and dining options. Location Location Location. 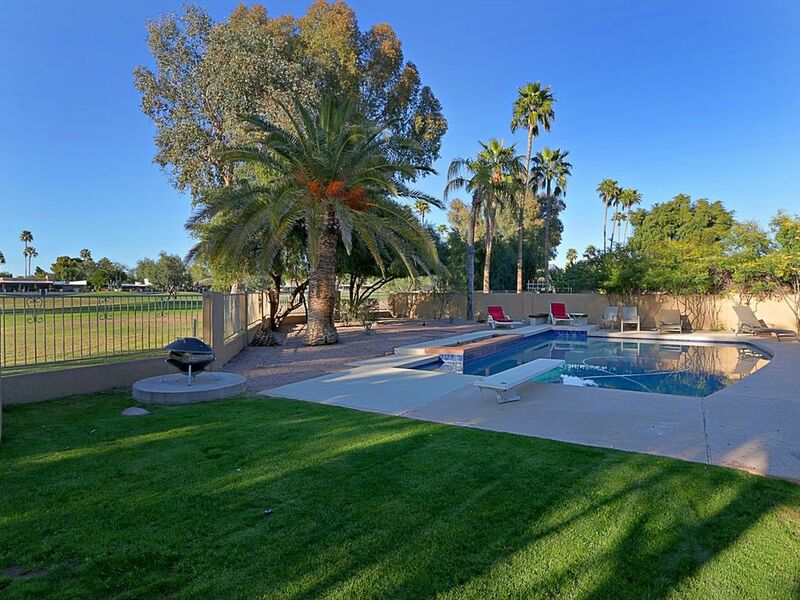 I almost booked a home in North Scottsdale but I opted for this home based on the location in the description and I am so glad I did. The home was close to everything!! Everything was within 5 to 15 minutes by car. There was also great bike trails and walking trails by the home and a private lake walking trail. The house itself was great well maintained, very clean and nicely furnished. The kitchen was fully equipped, there was a full washer and dryer. 4 large bedrooms, an extremely large living room, a separate family room and about 5 different eating areas. The home is also located right on the golf course but set back for privacy but yet you have amazing views, the positioning on the golf course is perfect as there is zero chance for a golf ball. The other thing I loved is you are allowed to walk the golf course early morning or after 5pm and there is a gate right from the home to the golf course which was really nice. I also considered the home as great value for what you get compared to what you would pay for a hotel or a condo in the area. The back yard had an enormous covered patio great for entertaining and the pool was much bigger than a standard backyard pool I would say it was twice the size of most pools I have seen in other vacation rental homes I have stayed in. The owner was extremely responsive and helpful. He gave me lots of great tips of what to do in the area. I would highly recommend this home to couples, singles, guys or gals golf outing and or a family trip. The home has a great floor plan and has a lot of space for a large family or a large group. I will definitely book this house again! This house sincerely is in an unbeatable location. You have walking trails, biking trails all by the house. You have everything nearby. We could have just rented bikes to get around. The Kierland shopping center is nearby the Fashion Mall is nearby. The baseball training center is nearby. The other thing we enjoyed is this home is located right on the golf course and there is a gate out to the golf course which you are allowed to walk in the mornings and evenings and it is just beautiful and peaceful. The home is positioned on the golf course where you still have privacy and no change of an incoming golf ball. The house itself is well laid out and nicely appointed. The master bedroom bed was the best I have ever slept in! The kitchen had just been recently remodeled with all new stainless steel appliances! The home also had all new flooring. The house was well maintained and the cleaner definitely did a great job. The home was very very clean! The outdoor area was great as it had a LOT of covered patio if you wanted to stay out of the sun the covered patio was probably over 750 SF alone and yet there were a lot of areas to sun yourself as well. All the bedrooms had their own TV plus there was 2 more TV's in the living room and family room. All the TVs were newer flat screens tvs. The owner was nice and extremely responsive to my numerous questions. He gave me a lot of ideas and pointers of what to do and see!. Oh I forgot to mention just down the street is the Hyatt Gainey Ranch which every night has a live band and the public is welcome. Also the Gainey Village shops are just down the street and a brand new Whole Foods Grocery just went in and the Gainey Village Healhclub and spa is also just down the street. The owner was able to get me a day pass for a fee and I highly recommend going to this Healthclub it was rated top 10 in the US and had numerous fitness classes,and thee best gym I have ever been too. I loved this neighborhood, home and location. I will definitely come back and I highly recommend it to familes, couples, singles, golf outing. I almost booked a home in North Scottsdale but I am so glad I chose this one as I spent zero time in the car! Oh one last thing there is a bike rental place very close to the home and I rented a bike to bike the amazing bike trail system right by the house. You can bike from the house all the way to ASU on a bike trail system or way up to North Scottsdale. It is a must do! Our family stayed for a week of spring training in March 2017 and loved the home. The outside patio was the highlight for us during a week of amazing weather. The kitchen was well appointed and everything worked great. And you can't beat the location. We all enjoyed walking around the golf course once play had stopped for the day. The owner was great to work with although we didn't really have any troubles where we needed his help during our stay. We will definitely look to stay here again on our next visit to Scottsdale. We had a great stay. Shawn was great to work with. He was in touch several times before & during our stay to make sure everything was good. He was quick to respond to any questions we had. They had just remodeled the kitchen with nice new appliances & plenty of cookware and dishes. There was plenty of space for our 4 couples to enjoy spending time there. Everything was clean & in good working order. It is right on the golf course with a HUGE pool, in an incredible location. You are literally 1 minute from Scottsdale's BEST bike trail system, walking trails, a private lake walk etc. Also, you are within walking distance to some great restaurants and shopping. The Hyatt Gainey Ranch is just down the street.